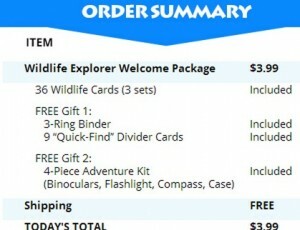 *HOT* HUGE Wildlife Explorer Kit Only $3.99 + FREE Shipping (VALUE of $82.95!) Binoculars, Flashlight, Compass, 36 Cards and More! Woohoo! You can currently hurry over to get a HUGE Wildlife Explorer Kit for just $3.99 + FREE Shipping and it’s a VALUE of $82.95! This would be great for any age!! I’m thinking it would be a great birthday or Easter gift also! Click here to order yours!! Important – To cancel any future shipments, contact the Customer Service Department by calling them. By canceling your account you will not receive any future shipments unless one was en route to you before you cancelled. Be sure to get a cancellation confirmation number. I order things like this all the time and they are super easy to cancel!! The price has changed to $5.95.